This is going to be somewhat of a weird one today, as I’m sure that the last thing on any MMORPG player’s mind is to add complexity or overcomplicate resource gathering, but hear me out. For the most part, I’m right there with, what I’d imagine to be, most of you out there. Resource-gathering professions such as mining and herbalism can be performed with little to no risk in games like World of Warcraft and Final Fantasy XIV. In both titles, you have the ability to make a decent amount of money in relation to the time invested, especially before flying capabilities are introduced in the newest pieces of content. These systems work, so why fix something that isn’t broken? I don’t think that they are broken by any means, but I don’t think they are perfect by any means. While they indeed “work”, they often feel like mundane tasks or simply a way to waste time. But, what if the stakes were made higher, but alongside even greater rewards? The best example of striking this balance is in Final Fantasy XI, but we must roll back to the hands of time to be more inline with the base game rather than factoring in its multiple expansions in order to fully appreciate the system. For those unfamiliar with older MMORPGs, they were often brutal in a multitude of ways. Often times, the brutality was brought to fruition by the anti-handholding nature of a given game’s mechanics. For example, a lot of Final Fantasy XI’s difficulty in its earliest days was simply because A) almost everything required a group and B) the game explained almost nothing to you. While townsfolk and quest givers would occasionally hint at things to do or places to go, you were, more or less, given free reign as to how to progress your character. This was further amplified by its (again, in the early days) more sandbox nature, where one could seek out powerful armor sets through monster drops, job-specific quests or by delving into its incredibly time-consuming crafting system (or all of above). But I’m not here to say the grass was greener on the nostalgic side. In fact, there is very little that, as an aging gamer, I still like about this arguably archaic design. Sure, the sense of camaraderie and achievement of tackling challenging content or finally getting that full set of artifact armor (that wasn’t always itemized THAT great, in retrospect) was amazing. But I also don’t have time to play for 10 hours a day like I used to, so setting the slider somewhere between the past and the present design is more so up my alley these days. I digressed to get to this point. In my opinion, the early days of Final Fantasy XI handled resource gathering professions (specifically, mining and logging) in the best way I’ve ever seen in any MMORPG. At its core, it is very much the same process as almost any game in the genre: you find a gathering node and you harvest it. Beyond the base concept lies many differences, however. For starters, gathering nodes were not omnipresent throughout an entire zone like they are in many games today. Often, resource spots were limited to a small section of a much larger zone. In addition, nodes were NOT shared or instanced among everyone present. In other words, if two people saw a node, only one of them could harvest it (much like in the early days of WoW). Before you dismiss the single-instance node design as a tedious, unfair system, consider this. Individual nodes within the gathering area would sometimes be spread far out from each other. Having “competition” in that kind of setting was actually beneficial, because it made nodes spawn at a faster rate. Adjusting your route to work in the opposite direction of your competition meant that both you and your competitor would benefit due to more frequent gathering nodes. That kind of design added an additional level of depth to resource gathering because it paid to always be weary of your surroundings. In order to mine or log in the first place, you first had to have pickaxes and hatchets on your character. Both of these tools had a chance to break, so bringing multiples of each was obviously the way to go. Today, Guild Wars 2 uses a similar, albeit simpler, system with nodes generally expending a single tool upon each use (unless you have the unbreakable store-bought tools). There is a level of RNG present in FFXI, however, that leads you to sometimes breaking tools without procuring any resource in return. On top of that, tools are much more expensive in comparison to something like Guild Wars 2, especially early on. The only way to combat breakages is through equipping mining/logging-specific gear. While this special gear drastically cuts down on your breakages (thus, improving your overall efficiency), it doesn’t get rid of the occurrence entirely. You’re probably thinking to yourself, “that sounds terrible”, but I see it as a way of separating the wheat from the chaff. If you wanted to be serious about resource gathering as a profession, you ultimately had to invest in this equipment. It gave you a goal early on to shoot for, and the rewards upon acquiring it was well worth the time and money investment. So, you’ve dabbled in resource gathering long enough to to secure a set of profession-appropriate gear and want to take it a step further. At this point, you’ve probably limited yourself to some of the lower level, lower risk areas but are seeking to literally “strike gold”. 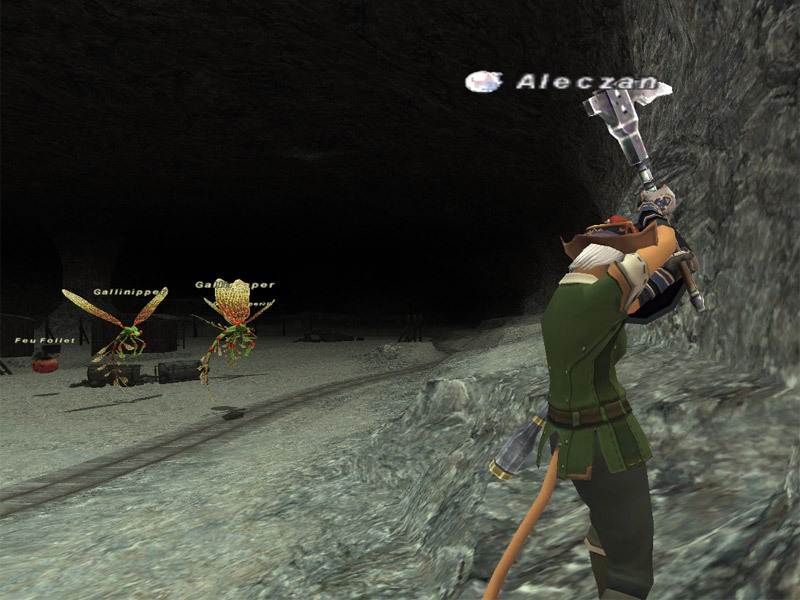 In Final Fantasy XI, there were numerous high level, high risk gathering locations that could pose danger even to those armed to the teeth. The tradeoff, however, was some of the most expensive raw materials in the game. The best example of this from early FFXI would be the infamous Ifrit’s Cauldron. This place was literally a disaster waiting to happen, housing some of the most dangerous enemies in the game and being incredibly difficult to navigate, especially without a map. 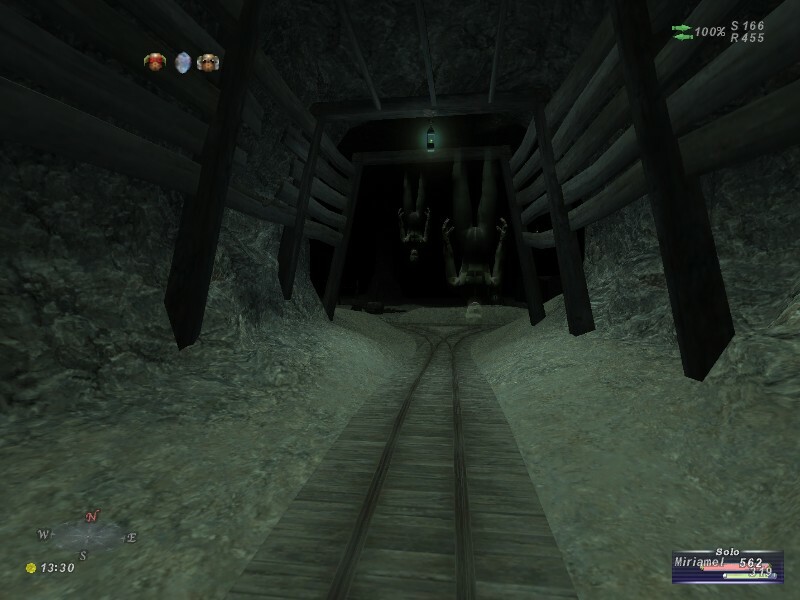 Most people that braved this area would perform some form of “sneak mining”, which was essentially a way to hide yourself from enemies via abilities and/or consumables. It was almost a mandatory practice in these types of places, because dying could set you back drastically. But sneak mining wasn’t as simple as “set and forget” because the effects would wear off periodically. You had to always be aware of your surroundings as to not accidentally draw the attention of enemies. But all of that setup and coordination could pay off BIG. High ticket materials, such as Adaman and Orichalcum ore would often sell for hundreds of thousands of gil per unit. Once you had a taste of those kind of profits, you were compelled to go face the dangers again and again. And the cool thing was that it wasn’t a mindless or menial task either, you were encouraged to be aware of your surroundings at all times in order to be as efficient as possible. It wasn’t a matter of clicking a node for profit, the venture felt more like an entire mini-game in itself. While I’m not necessarily saying that we should, brick for brick, go back to that design, I do miss that level of risk/reward when it comes to gathering in MMORPGs. There was something special about preparing to venture out to a genuinely dangerous location in search of its vast riches. Since my MMORPG experience these days is limited primarily to WoW, I’d love to hear about any modern MMO that handles resource gathering in the same vein as Final Fantasy XI. Be sure to let me know!